My plane landed in Cairo in the early hours of the morning on May 27, the day of a key protest in Tahrir, Cario dubbed the “Revolution Part II.” After a few hours of jet-lagged sleep, I headed to the square with my hosts. In this blog post, I cannot give an account of the complex political discussions taking place among activists and among the Egyptian. Instead, I am going to try to communicate the “spirit of Tahrir” as I witnessed it: festive, self-organized cautious, sharply political and ambitious. (Also, I will blog in two parts as I am still in Cairo and don’t have time to write everything in one post)! There was a lot of tension before May 27; rumors were flying around. In fact, after announcing that I was planning to attend, I received several emails from local friends cautioning me to be careful. The key demands of the protest were respect for law, constitution, and end to the military tribunals of dubious legality and transparency. A few days before the protest, the Supreme Council of the Armed Forces issued a statement that it would not protect the Friday protest due to “the possibility that suspicious elements will try to carry out acts designed to drive a wedge between the Egyptian people and its armed forces.” This only heightened tensions as some saw this as a veiled threat. 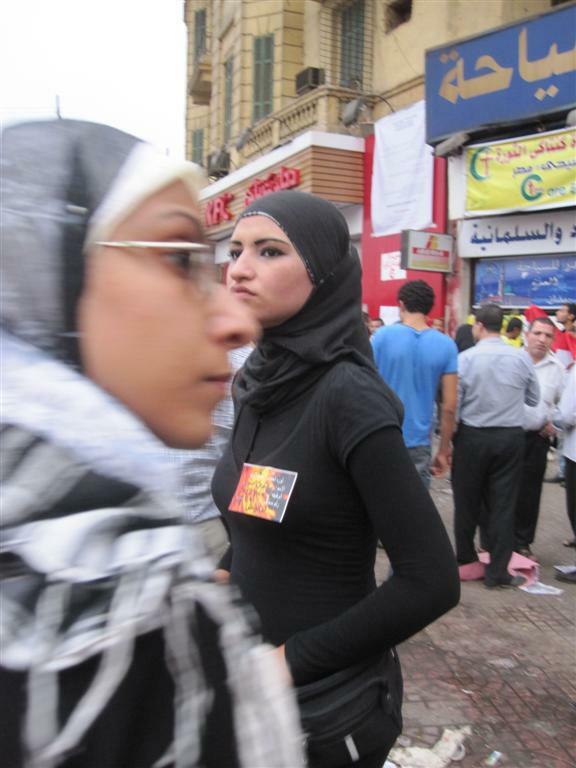 Muslim Brotherhood, too, declared that they were not joining the protests and talked about it as an undesirable event. 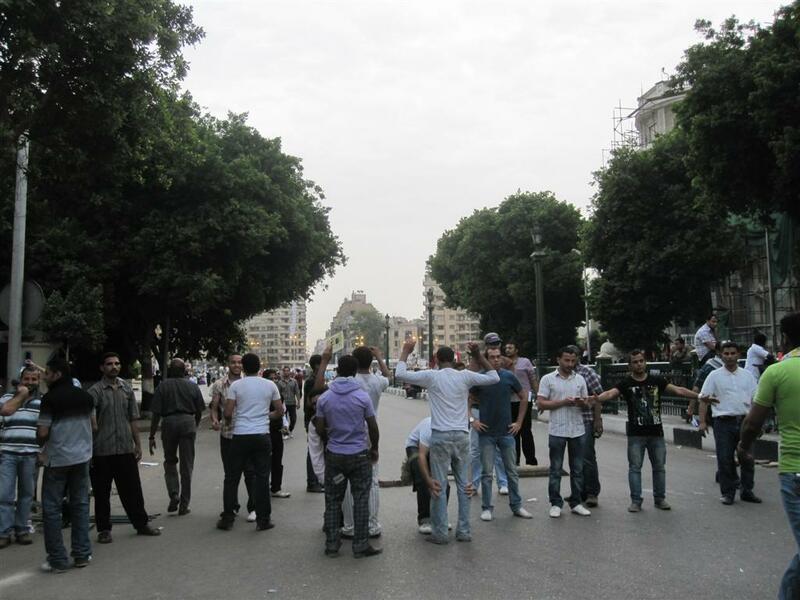 However, the end result was that the protest was self-organized by the Coalition of the Youth of the Revolution. There was not a single police or Army officer in sight. (There were apparently four policeman quietly stationed near the Egyptian museum). And, to the relief of many, it was a festive, peaceful and rambunctious event. While it could also be seen as a more liberal event, I saw many people who were clearly not from the youth coalition, including some young people from the Muslim Brotherhood and other religious groups as well as many families and others. The square was packed with tens of thousands of people, along with street merchants selling flags, posters, Egyptian “Jan25” themed t-shirts, fruit juices, sweets and whatever else one may need! 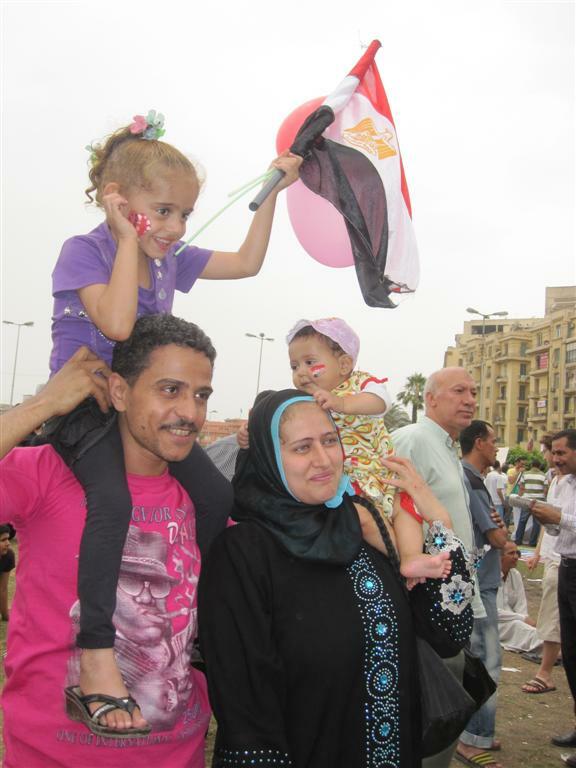 Many people brought their families and many children, some with colors of the Egyptian flag painted on their cheeks, were happily running around under the hazy, hot Cairo sky. A wicked sense of humor was on display everywhere. Two young men with distinctly Islamic beards carried a large sign with a sign for: “Salofya Costa”, i.e. 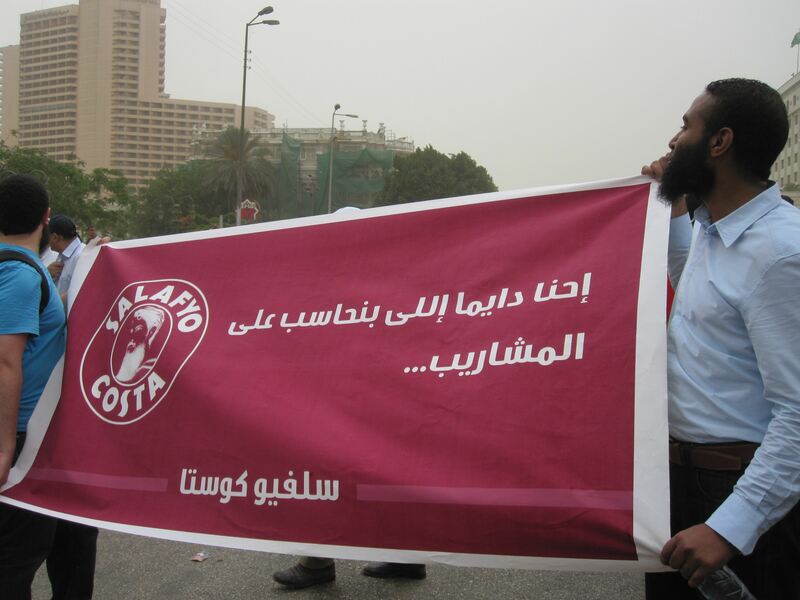 a Salafi Coffeshop – a wordplay on the coffee shop “Costa Coffe”. Their banner declared that the drinks/coffees were on them since, as Salafis, they always get stuck with the bill and the blame for everything. I do not mean to minimize the harm that can come from religious extremism, but surely interaction with a sense of humor and irony may be a first step in trying to figure out peaceful, tolerant ways of co-existence among people of different persuasions. I have since learned that these men are from a breakaway religious youth group who are bothered by the fact that their elders refused to interact with larger society or with people of opposing views. 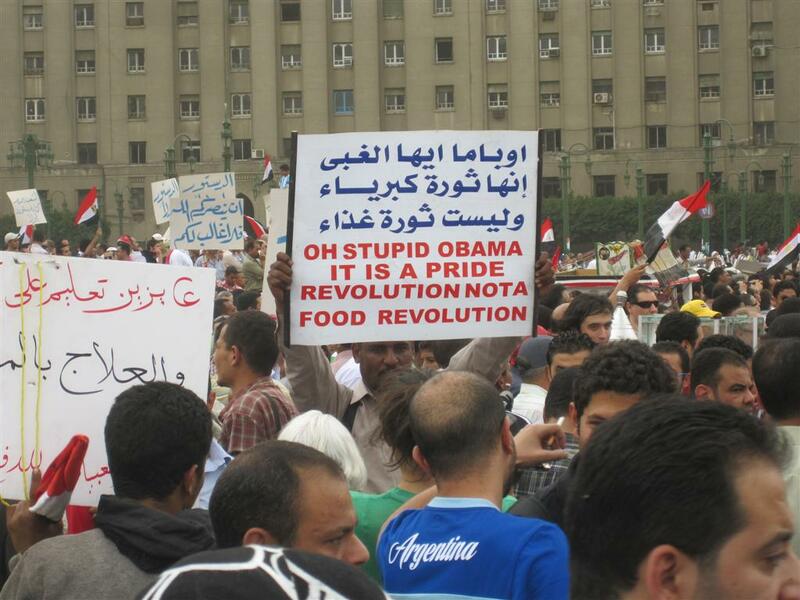 Most of the humor, however, was directed against Mubarak and the old regime. 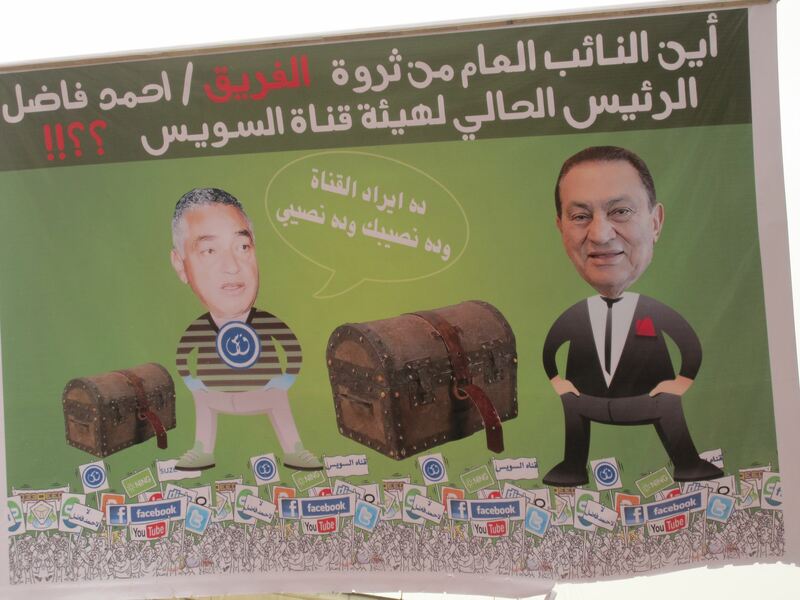 Here, this poster asks about where the revenue is and shows Hosni Mubarak and head of the Suez Canal authority, Ahmed Fadel, sharing it amongst themselves – here’s your part, here’s my part. Also, Egyptian protesters are clearly aware of the world attention on their remarkable experience. In fact, as I have argued in many places, one of the main dynamics fueling the revolution derives from the structure of the attention economy in the networked world. In a strong feedback loop with Al-Jazeera, citizen-media activists on the ground were able to mobilize the attention of their countrymen and women, as well as the whole world, to one relatively small spot in a large, sprawling city in a large, diverse country. 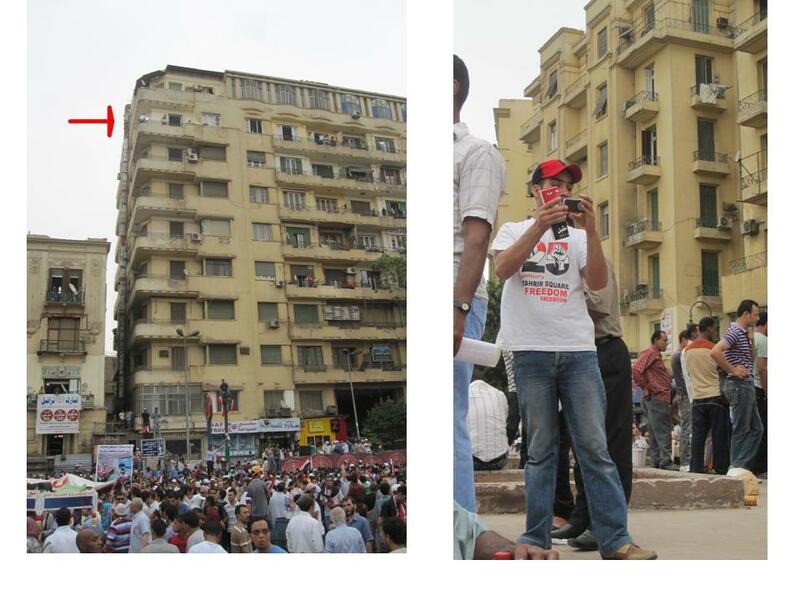 It is from that masterful, heroic attention-grab grew out the power of Tahrir. Here, below, two pictures tell this story. On the right, is the Al-Jazeera camera on the 8th floor of a building overlooking Tahrir (here’s the hilarious story of how it got there). On the left is a activist on the ground, filming with his smart phone which is surely connected to social networks which open up the world. In fact, this was a common-theme I heard again and again: that a feeling of pride and ownership of the country had emerged after the revolution and this was the main driver of the protests. Clearly, in this brief visit, I have been talking more to people who are not desperately poor so I don’t have the opinions of the wider cross-section of the population. 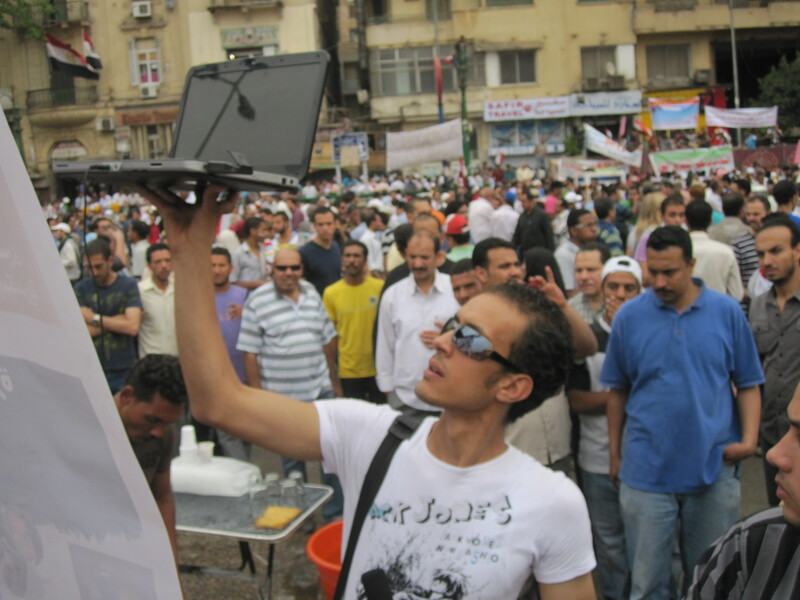 (In fact, Al-Ahram was in the field doing a survey which will compare the views of the people protesting on the street on May 27 with those elsewhere in Cairo). However, everyone I talked to found a way to express to me, sometimes in perfect English, sometimes with barely more than hand gestures and aids of dictionaries, how proud they were of their country, of the protests, of the fact that they were able to oust Mubarak. After every protest in Tahrir, volunteers carefully clean up all the trash and leave Tahrir sparkling, something, I am told, almost unimaginable during the days of the old regime when such civic pride and engagement. I got interviewed by a young man who apparently has started a Facebook page inviting people to visit Egypt again! He had taken it upon himself, with his friends, to try to reattract tourists. (By the way, it is an excellent, excellent time to visit Egypt. Prices are down, tourist sights are not crowded and the people are beaming). Many guidebooks will warn you against Cairo cab drivers trying to scam tourists; here, cab driver after cab driver diligently tried to give me back exact change and only reluctantly accepted (modest) tips. I asked around if this was typical and if I were breaking some custom with (modest) tips – it appears, no, this is the new Egypt. People are eager, hopeful, desperate and ready, ready, ready for a new start in this beautiful, neglected country. There was not a single police or army officer in sight. If there were any, they must have been station quiet away from Tahrir square. The organizers had set up rope and human barriers at key entrances and were searching everyone. This was more an effort to show ownership of the square than to provide deterrence to a truly determined party as the square, as the police found out in January, is quite large with multiple large and small entrances. The organizers were identified with orange badges and took turns manning (and womanning as females were searched by women volunteers) the many entrances. At my last entrance, the polite young woman doing the search apologized to me, as she seemed to do to everyone she had to search, even as she did a fairly good job of looking through my small purse. Unlike regular police, she was not socialized into the idea that there is nothing disturbing about treating people as if they may do something wrong before they’ve done anything wrong. 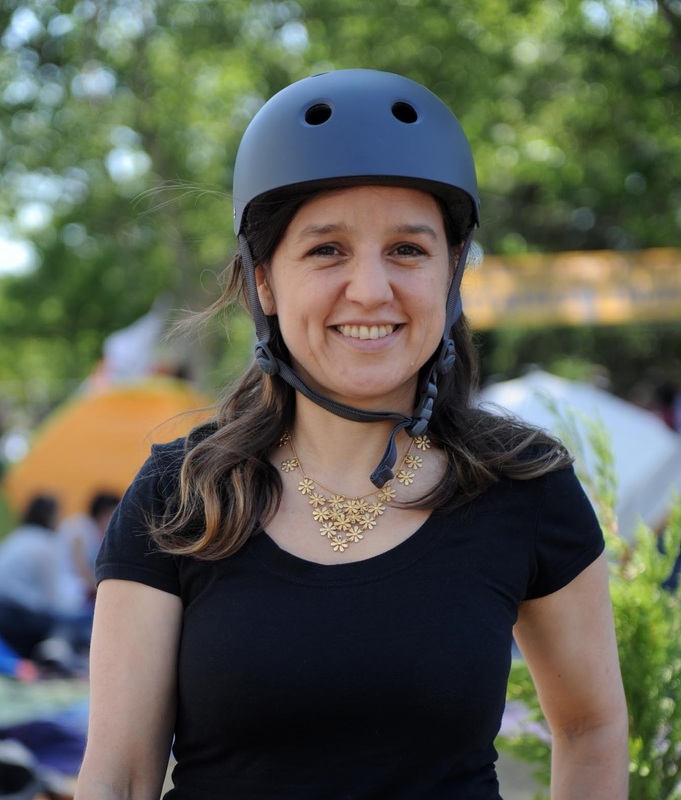 She did her job diligently, knowing it needed to be done, but also clearly uncomfortable with her role as treating people as presumed troublemakers. It was as if she symbolized the tense transition facing the idealist street activists of Cairo who are now struggling with questions of governance, of organization, how to contest elections and how to deal with the myriad of powerful forces from the Army to others. In fact, these discussions seem to come up quite often among the activists, especially regarding the question of the “power of the street” and these kinds of protests versus electoral results. Some argue that the street has its own power even if this doesn’t necessarily translate into electoral power; others are worried about better organized groups like the Muslim Brotherhood and allies of the Army gaining the lions share of the seats in the next election; and therefore writing the constitution to their liking, before the more liberal, secular or anti-authoritarian groups have a chance to organize. Indeed, this seems to be the challenge for this transition. At the end of the night, there was discussion among the activists whether to continue with a sit-in or whether to leave. In the end, they decided to leave, to organize for a bigger protest next week. As the night fell, the protesters left Tahrir with hope, with determination and with the well-deserved pride in having pulled off a festive, self-organized demonstration. Their challenges are many and their battles uphill, but their level of organization and optimism is nothing less than impressive. This entry was posted in Uncategorized on May 30, 2011 by zeynep.